The first part of this maxim – “Strive for perfection in everything you do” – guides the company’s every action particularly during the creation of a new motor car. The second – “Take the best that exists and make it better” – has been clearly evidenced in the success of both Phantom Series II and Ghost Series II as they were carefully updated in 2012 and 2014 respectively. And when Rolls-Royce judged that it was time for an authentic gentleman’s Gran Turismo to return to the world stage, it was guided by the third part of Sir Henry’s maxim: “When it does not exist, design it.” And thus, Wraith was born. In the most challenging times, the phrase “It is always darkest just before the dawn” – originally coined by English Restoration preacher Thomas Fuller – resonates as a beacon of hope. This early morning darkness, where apparitions such as phantoms, ghosts or wraiths have been imagined, and where one’s apprehensions lurk, is brushed aside by an energising burst of early morning sunlight as one awakens to a new dawn and the endless possibilities of a new day. Such was the feeling in 1952 as the world was finally emerging from a period of economic austerity following protracted war. That year, the world looked forward in hope as the world’s first passenger jet , the British deHavilland Comet, made its first commercial flight; the Big Bang Theory of the creation of the Universe was first propounded, and Queen Elizabeth II ascended the throne of the United Kingdom. That very same year, the Rolls-Royce Silver Dawn drophead, which became the muse for the designers of the new Rolls-Royce Dawn, was finished by Rolls-Royce coachbuilders Park Ward and delivered to its first customer, Colonel W.A. Phillips in Canada. A new beginning for Rolls-Royce at the time, the original Silver Dawn was the first Rolls-Royce to be offered with a factory-built body. 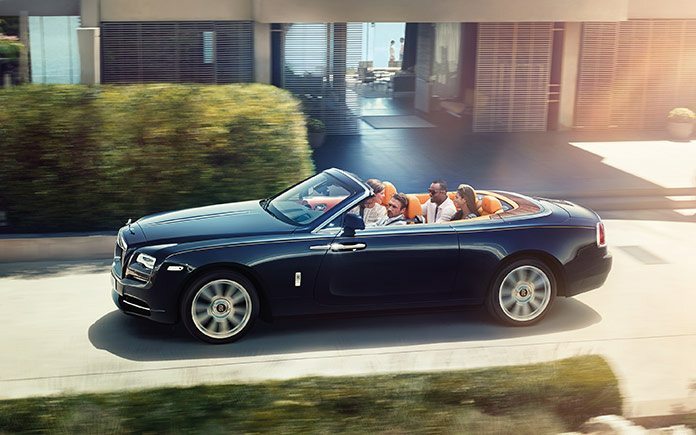 However, the drophead Rolls-Royces that carried the name Silver Dawn continued to be coach-built for individual customers, ensuring their uniqueness and rarity, and embodied the optimism of the age as we began to enjoy life again and pursue La Dolce Vita. This famous and rare Rolls-Royce name was only ever applied to 28 very special drophead bodies between 1950 and 1954. Rolls-Royce’s new Dawn has taken inspiration from the Silver Dawn, whilst delivering a world first in super-luxury motoring – a cool, contemporary interpretation of what a super-luxury four-seater convertible motor car should be in 2015 – rare, refined and the most social super-luxury car there is. 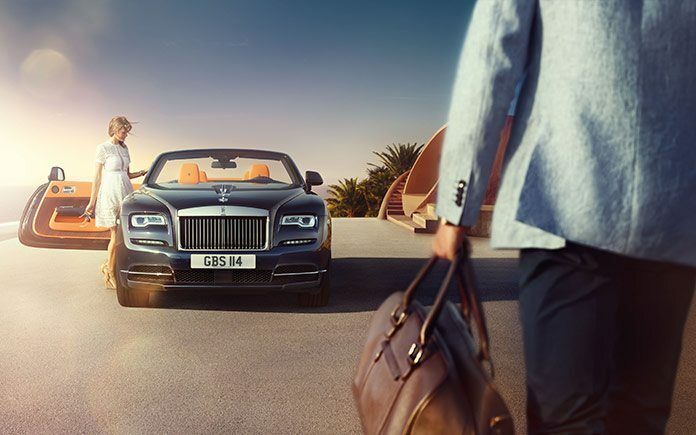 Much like the 1952 Silver Dawn drophead, the new Rolls-Royce Dawn stands apart from its stable mates, featuring 80% unique body panels. Indeed such attention has been paid to ensuring this amazing new dawn for super-luxury motoring delivers on its promise, even the tyres that connect the new Rolls-Royce Dawn to the roads it will glide over have been specially developed to deliver the pinnacle ‘magic carpet’ ride expected of every Rolls-Royce that leaves The Home of Rolls-Royce at Goodwood, England. And, specific engineering and manufacturing attention has been paid to the creation of the Dawn’s roof. Unheard of anywhere in the modern motor industry until now, the roof of the Rolls-Royce Dawn delivers the silence of a Wraith when up and operates in almost complete silence in just over 20 seconds at a cruising speed of up to 50kph. 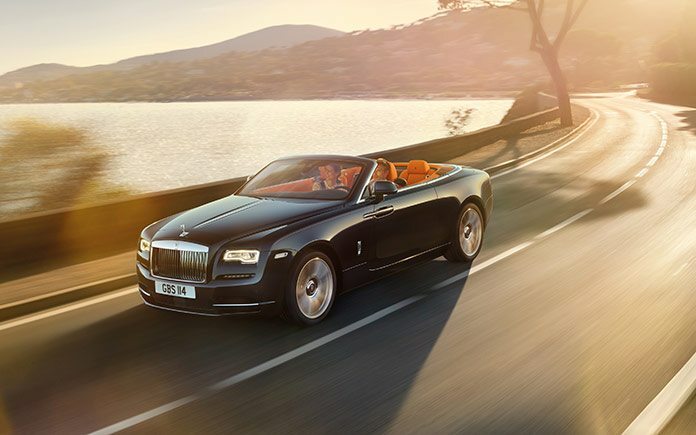 It is safe to say that the new Rolls-Royce Dawn is the quietest open top car ever made. Commonly held, a 2+2 is a configuration with seating for the driver and one passenger in the front plus two smaller seats for occasional passengers or children in the rear. Space in the rear is most noticeably absent in terms of longitudinal leg-room, thereby reducing the comfort and practicality of the car. In the case of a convertible body type, this reduction in space is often the result of the manufacturer’s inability to package the convertible roof together with boot and rear passenger space. The result is a sector populated exclusively by open-top cars that Rolls-Royce would consider compromised and ‘anti-social’. The grille and bumper focus attention on the horizontal lines of the car rather than the traditional vertical lines of the other members of the Rolls-Royce family. The bumper now incorporates the number plate surround and a new focused lower air dam. The mesh in the lower valance is recessed and black in colour, helping create a sense of depth which supplements the depth in the grille. Also, chrome ‘blades’ act to plant the car while also complementing the horizontal lines and accelerating the flow of the eye around the car thus increasing the impression of power and width. 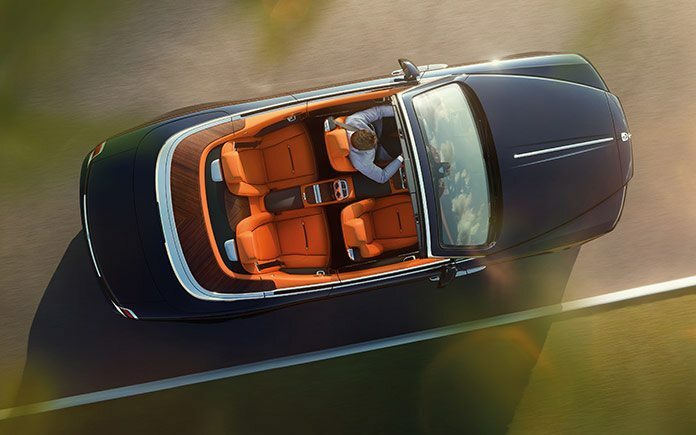 Once again Rolls-Royce’s unique coach doors come into their own in a drophead format. The coach doors are impressive and graceful. The doors complement the long front wings and relaxed waft line, creating a long body profile and a cosseted cabin. 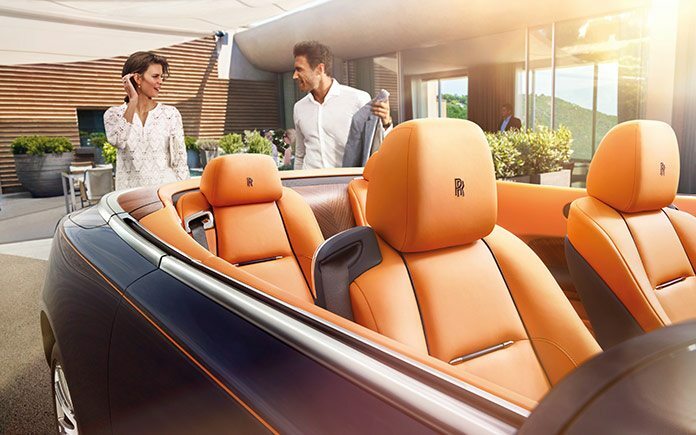 The Rolls-Royce Dawn offers four very individual, cosseting seats. The vehicle is a full four seater and so there is no compromise in comfort wherever you sit. The seats have been designed to help emphasise the energetic, yet elegant intent and sense of purpose of the car, complemented by an intersecting full length centre console. The upper seat back houses the seat belt harness, which together with the pillarless bodywork enhances and emphasises the slingshot of wood or leather with no breaks in the flow-lines. The wood on the surfaces of the trays are also book-matched down the centre console in a chevron pattern pointing forward providing an accelerated feel. 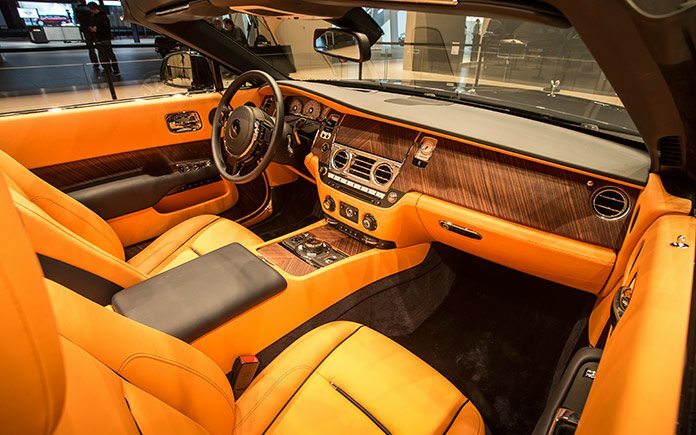 Without question, the engineering highlight of the new Rolls-Royce Dawn is the new roof. To be a true Rolls-Royce, Dawn had to deliver the hushed driving experience associated with all Rolls-Royces. At the same time the only choice for a Rolls-Royce was a fabric roof for reasons of aesthetics, romance and brand appropriateness. There is nothing more romantic than driving a convertible in the rain at night and hearing the drops pattering on the roof. In conversation with its customers, Rolls-Royce realised that they felt the same way. For those not so worried about silence and more interested in sharing music and entertainment with their friends, Rolls-Royce’s Bespoke Audio system has been specially calibrated for the unique configuration of the Rolls-Royce Dawn. Finely tuned by expert Rolls-Royce audio engineers, Bespoke Audio is the most exhaustively designed automotive hi-fi system ever developed and has been minutely calibrated to compensate for the dual personality of Dawn. Sixteen individually-tuned speakers, with both theatre and studio settings, deliver a pure ‘larger than live’ sensation. Two bass speakers located in the boot complement seven tweeters meticulously placed throughout the cabin. The system utilises a highly sensitive microphone to constantly monitor ambient exterior noise, subtly adjusting the volume and tone settings accordingly to ensure the system delivers consistent perfection. The technology complements this, with frequency and phase correction for individual speakers eliminating potential loud and dead spots caused by outside influences. The beating heart and soul of any Rolls-Royce motor car is the beloved twin-turbo 6.6-litre V12 powertrain. With a power output of 563bhp or 420kW @ 5,250rpm and a torque rating of 780Nm or 575 lb ft @ 1,500rpm, Dawn’s driving experience is exceptional. In common with the entire Rolls-Royce family of fine motor cars, the new Dawn is at the very vanguard of automotive design and technology. Dawn presents drivers with a suite of discreet technologies that ensure their leisure time in the car is a super-luxurious effortless experience. Key is the discreet placement of the car’s technological functions. Dawn is therefore fitted with the Spirit of Ecstasy Rotary Controller, an intuitive, one-touch solution that allows the user effortless access to media and navigation functions. The Rolls-Royce Dawn’s effortless dynamism is augmented with the addition of Satellite Aided Transmission, a technology that made its global debut on Wraith in 2013. 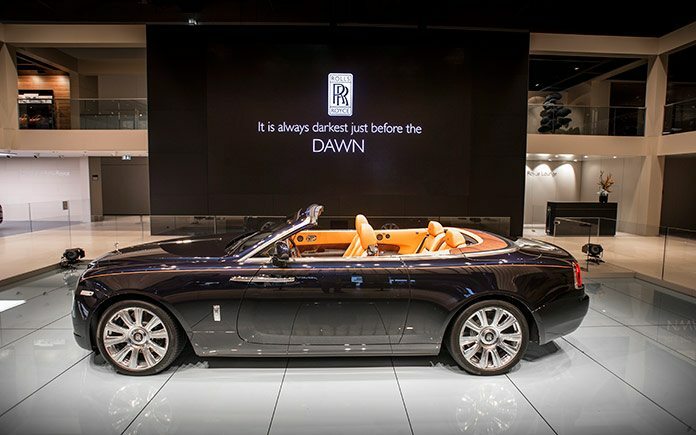 The most recent developments in LED lighting technology have also been applied to the Rolls-Royce Dawn. The way this light is managed is significantly enhanced by adaptive technology. Electronically controlled reflectors move in the direction of travel in response to wheel turns to give a greater depth of vision when cornering and a whiter, brighter light ensures effortless and safe driving on dark roads whilst helping reduce driver tiredness.